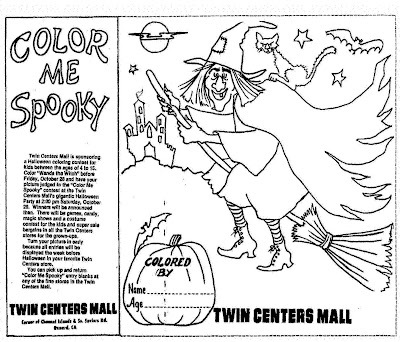 Twin Centers Mall in Oxnard, California held a "Color Wanda the Witch" contest for Halloween. This color page and entry form appeared in an Oxnard newspaper on October 17, 1977. I like the cat sitting on Wanda's back - I have named him Lewis. My mom, Wanda, has two brother cats named Morse and Lewis (is you like Mystery on PBS you will recognize the names) and Lewis is her main man.